In this article, we will show you, How to write a Java Program to Add Two Numbers and print the output. This simple Java program let the user to enter two integer values and then add those two numbers and assign it to variable sum. Within the following statements, System.out.println statement will print the statement inside the double Quotes and next we are assigning the user entered value to integer variable Number1. Once the user enters the First Number, following statements will ask for the second number. TIP: You can remove the second System.out.println statement to shorten code. Within the next line, we used Java Arithmetic Operators + to add Number1 and Number2 and then assigned that total to Sum. Following System.out.println statement will print the sum variable as output (10 + 25 = 35). In this Java program we are using the same steps that we followed in our first example but we separated the logic and placed in the separate method. From the above code snippet, you can observe that, this method accepts two arguments of integer type. Within the function we declared integer variable Sum to store the addition value. Next, we performed arithmetic operation to add two integer numbers. 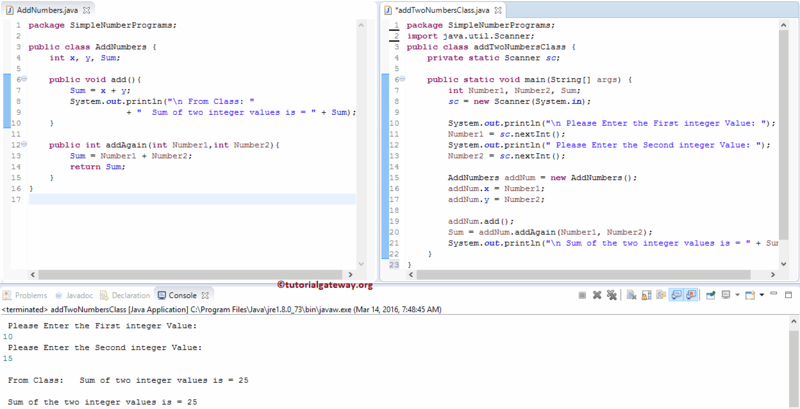 In this example, we are dividing the code more further using the Object Oriented Programming. To do this, First we will create a class which holds two methods. First we declared a function add with zero arguments. Within the function, we performed the arithmetic addition and printing the Output using System.out.println statement. Next we declared an integer function addAgain with two arguments. Within the function, we performed the arithmetic addition and returning the integer value. Next, we are assigning the user entered values to the AddNumbers Class variables. Next, we are calling the add method. Note, this is the first method that we created with void keyword and this method will add two numbers and print the output from the AddNumbers Class itself. Next, we are calling the addAgain method. Note, this is the second method that we created with integer data type. Lastly, System.out.println statement will print the sum variable as output (10 + 15 = 25).